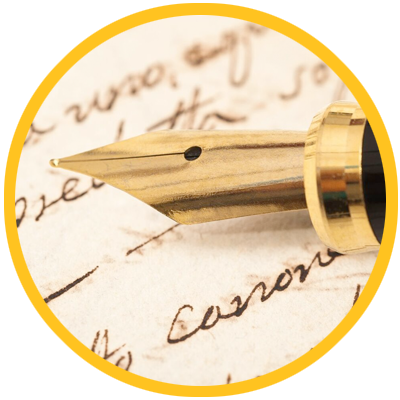 Handwriting has a rich history that encompasses many cultural traditions. Symbols and drawings known as pictographs are generally thought of as the first examples of handwriting; before that, all human communication was verbal. Some of the earliest examples of writing are Sumerian cuneiform and Egyptian hieroglyphics. Because these early methods used so many symbols, writing was very complex and left to specially-trained scribes. Around 1850 B.C., the Phoenicians adapted Egyptian hieroglyphics to represent the sounds of their language – considered to be the first alphabet! It was written from right-to-left, and was comprised of only 22 symbols, which simplified the writing process. It was this series of symbols that was adapted by the Greeks, who added symbols for vowels, and eventually changed the writing orientation from left-to-right. This version was further adapted by the Romans, giving rise to Latin and forming the foundation for the modern Russian alphabet that we use today. These developments did not only shape how we communicate, but they shaped the tools with which we communicate. Different tools were developed to suit each of these emerging writing styles. The Sumerians wrote on long tablets made of wet clay, which was prone to smudging. Around 2400 B.C., Egyptians began using reed brushes and papyrus for writing. Ink flowed smoothly on papyrus, which sped up the writing process. This enabled writing to be used not only for religious purposes, but for commerce. Writing advanced with the Romans, who invented bookkeeping and eventually, letter-writing. The Romans wrote with a tool called a stylus, which was made of metal and left light marks on papyrus. In fact, the stylus is the precursor to the modern-day pencil! The development of the printing press in the 1430s, while changing how people communicated, invigorated handwriting. Engravings that featured loops and curls to emulate the written word became popular, and as a result, so did the study of penmanship. Elegant handwriting became a status symbol. After thousands of years using quill pens, the fountain pen was invented in 1702 by a Frenchman named M. Bion, in an attempt to create a writing instrument that could hold its own ink. These early fountain pens would often spill and leak, and the design was greatly improved by Lewis Waterman, an insurance salesman, in 1884. The invention of the ballpoint pen in 1938 by Laszlo Biro further democratized writing. The product was simple to use and came at an affordable price for many consumers. Approximately 30,000 were sold in the first week that the product hit shelves in the U.S.!